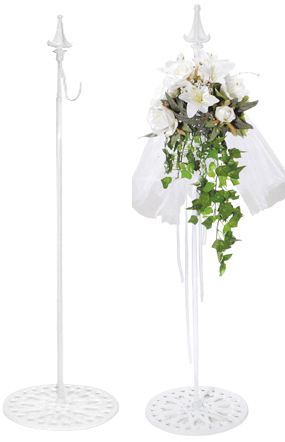 Wreath Hanger Adjustable, White Centerpiece Isle Floral Display Hanger for Weddings and Events 38"
Home > Wedding & Event Decor > Wedding Arches & Arch Trees > Hanger for Wreaths & Floral Decor - White - Adjustable to 62"
Floral Display Hanger & Wreath Hanger White Adjustable to 62" - Our white metal stand with hook is perfect for hanging flowers, bows, wreaths and more! Create Isles by hanging tulle fabric from one to the next. 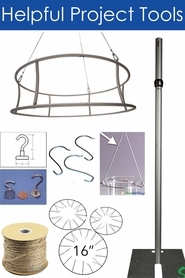 An added bonus is that with a simple twist of a wing nut, this stand adjusts from 38" tall to 62"! It comes in 2 pieces - simply screw the stem into the base and you're ready to go. The base is 10" in diameter and has a heart cutout design. The stem is a 3/8" thick square. I am so glad I found this site! I love everything I have purchased and will definitely be buying again! !